Both deliver impressive mobile VR experiences, but one has an edge right now. 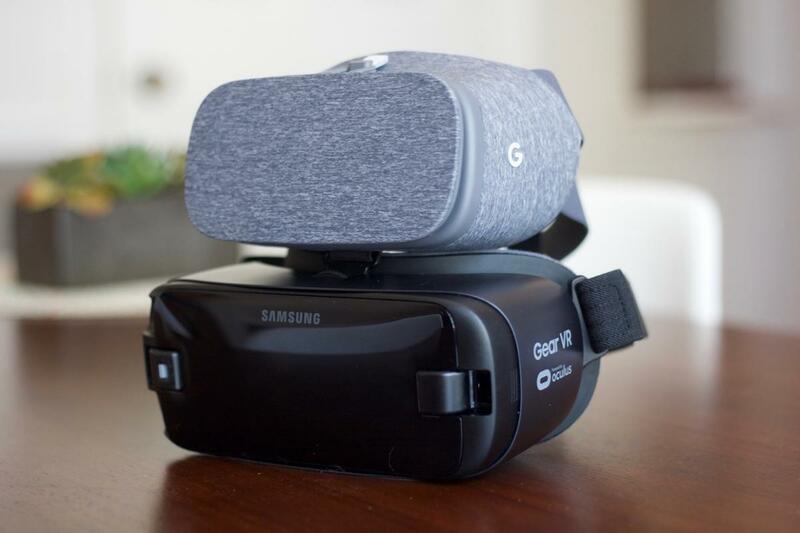 Google was the first major company to explore phone-based VR with its Cardboard experiment, but then Samsung took things to the next level with the premium Gear VR headset, which has seen a few different hardware variations since late 2014. And now Google has Daydream. Gear VR and Daydream are very similar in a few key ways: they’re both powered by top-end Android flagship phones, which slide right into each respective headset—and now with the new Gear VR Controller, both have wireless motion-sensing remotes ideal for games and navigating apps. Both also deliver comparable experiences, and have some of the same apps available. But there are also key differences, and that’s where you really need to take note. Each headset only works with a select number of phones—all expensive and powerful ones, of course—and the VR hardware itself varies in terms of benefits and drawbacks. Eyeing a new Android phone and think the VR edge could sway your decision? Here’s how this battle shakes out right now. Despite their comparable uses and abilities, Samsung’s Gear VR and Google’s Daydream View headset shells feature very distinctive designs. True, both have the same general look of giant goggles and they strap onto your head, but from there, these makers chose different paths. The front shield snaps off to reveal the slot where your phone snaps in. Each consumer Gear VR model has followed the same basic design, which is very heavy on plastic. It’s fairly lightweight but chunky, and the phone snaps in securely so that the screen rests right in front of your face. You’ll find a large touchpad built into the headset itself, on the right side of the shell, along with home and back buttons. On the top is a dial that lets you change the focus of the lenses, letting you quickly find the sweet spot. Meanwhile, the Daydream View is soft. Yes, soft! It has plastic elements, but the shell itself is wrapped in a luxurious fabric that feels like comfy pajama pants, while the part you stick your face into is like a running shirt wrapped around a pillow. That’s very atypical for VR hardware, but it sets the Daydream View apart from the pack, plus the shape is a lot more compact. Just lay the phone flat and then fold the door up and secure the bungie latch. 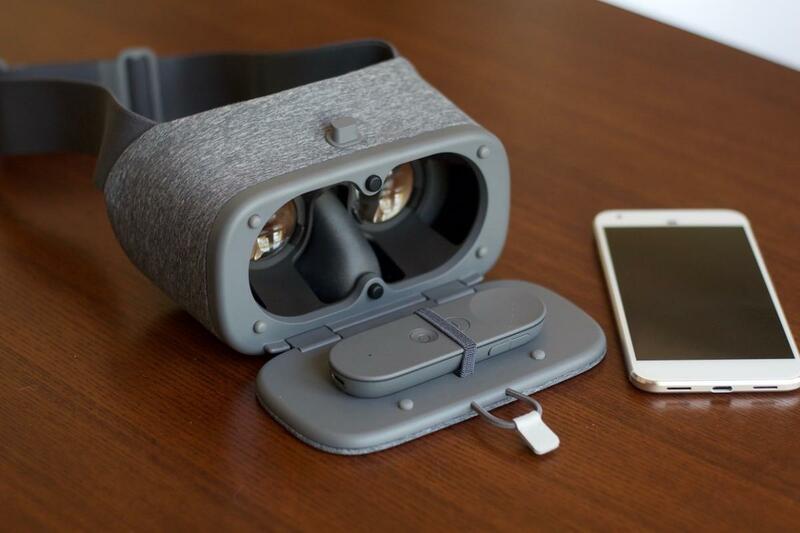 Unlike the Gear VR, your phone doesn’t snap into place with the Daydream View. Instead, you place it between the shell and the door, and it’s held into place with little rubber stoppers, as well as a bungie cord latch on top. It’s done this way so that the headset can work with a number of different Android flagships, all with varying shapes and sizes. Although similar in approach to what Cardboard did, it’s still a snug fit: you don’t have to worry about the phone sliding out easily during use. Daydream deserves credit for being the first to bundle in a wireless remote standard, which means that every app and game uses it in some fashion. It’s primarily used as a pointer for navigating menus and selecting items, but the motion controls also allow you to, say, steer a car or throw virtual items. Clicking in the touchpad, meanwhile, lets you easily interact with things. 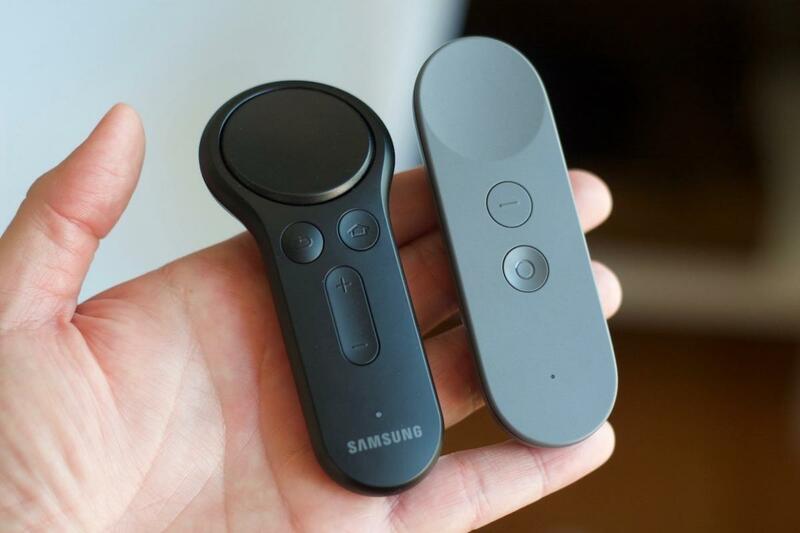 They’re about the same size, but the Gear VR Controller has a larger touchpad button and a trigger underneath. Samsung is only just joining the party, bundling in its new Gear VR Controller with the new Galaxy S8-compatible headset, as well as selling the Controller separately for use with the last couple consumer headset models. You’ve been able to use traditional gamepads with the Gear VR before, and you still can, but they’re sparsely supported: Minecraft is the biggest example of a game that requires a full gamepad, but nothing else is nearly as notable. The Gear VR Controller, meanwhile, is clearly built in the mold of the Daydream remote. It’s another one-handed wireless effort with abig touchpad button, home, back, and volume control buttons, and built-in motion controls. Samsung has one big advantage here: a nice, fat trigger button on the bottom, which not only allows another input option for all games, but also specifically empowers shooting games (like Drop Dead). Daydream’s covert controller storage spot is super clever. That’s a benefit, for sure, but the Gear VR doesn’t require the Controller, and the vast majority of existing experiences don’t use it meaningfully. We’ll surely see more and more apps and games implement Controller functionality soon, now that it’s standard for the platform, but Daydream has had that going on since the start. There’s no input fragmentation for Daydream between the haves and have-nots. Both controllers occasionally need to be recentered, as their positioning tends to drift within the VR world, but that’s as simple as holding down the home button in both cases. However, I also had a couple of issues with the Daydream View’s controller, where I’d notice very janky or laggy inputs. I haven’t been able to replicate the problem, but it has popped up a couple of times and really hobbled play in those instances. Comfort is one of the biggest differentiators between the headsets, and it’s in large part because of how they approach straps. The Daydream View might look like the more comfortable option, due to its soft touch and fabric exterior, but I’ve found the opposite to be true. 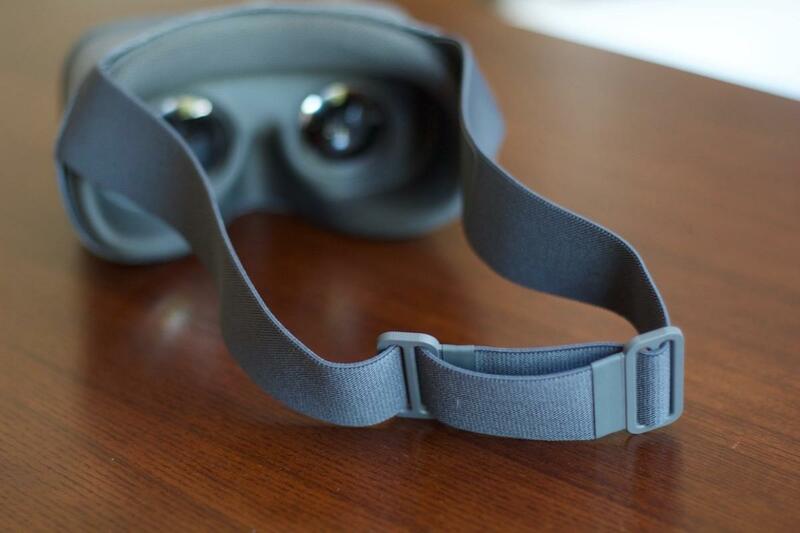 The added top strap helps keep the Gear VR from sliding down your face during use. See, the Gear VR has one big strap around the back and an optional, smaller second strap that goes over the top of your head. The straps loop through plastic holes on the headset and then connect back to themselves and each other with Velcro. Not only does that provide a snug, yet fully adjustable fit, but it also ensures that your setting stays intact even once it’s off your head. And on the face, I find it fully comfortable. There’s a soft, cushioned lining around the faceplate where it makes contact with your skin, and the material behind it is thin, flexible plastic, meaning it shouldn’t hurt your face—unless the straps are too tight. 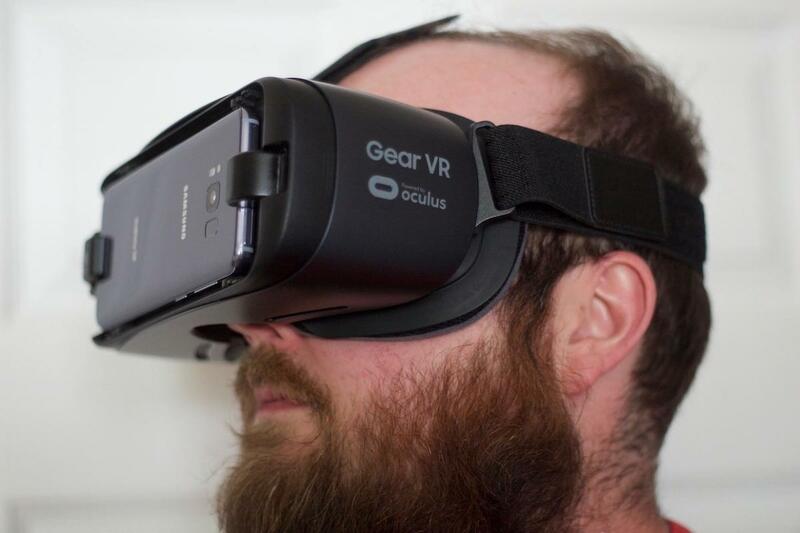 With the extra top strap, it’s possible to secure the Gear VR in a way that ensures it won’t droop down during use. The Daydream View strap doesn’t stay as snugly fixed to your preferred setting. Daydream View’s strap, by comparison, isn’t as reliable. It’s permanently stitched to the headset, and you just get the one strap around the back of your head, which can be adjusted by tugging it left or right through the buckles. However, it’s easy to lose your setting once you take off the headset, and the lack of a top strap made it difficult for me to find a setting that was both comfortable and secure. Typically, I have to secure it so tightly that it presses awkwardly against my face, but that’s better than having it sag during use. Gear VR has another advantage here, and it comes with the focus dial up top. Thanks to that little dial, I can take off my glasses (I’m nearsighted) and use the headset clearly without them, although the current Gear VR model has ample space within to fit glasses. The Daydream View has a fixed focus and less space within for glasses; it’s usable, but not nearly as comfortable. 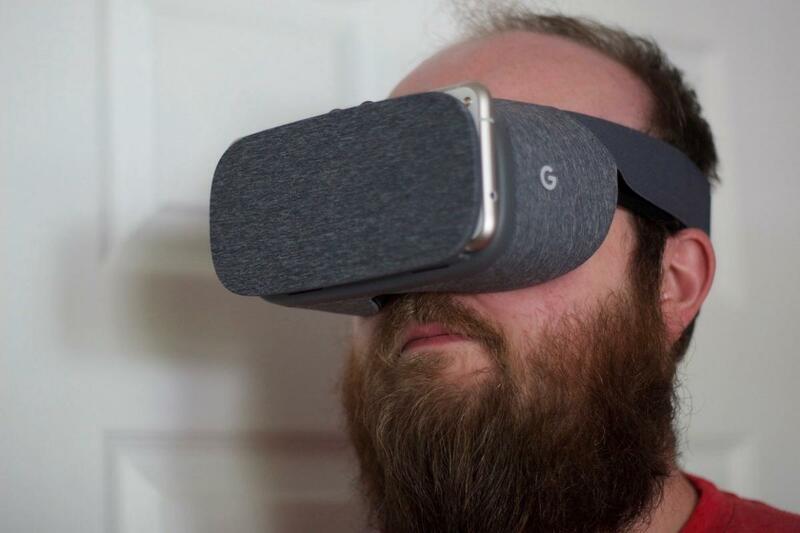 The Daydream View tends to slide down my face unless I strap it on a little too tightly. On the other hand, our original Daydream View reviewer found the headset more comfortable on his head than the first consumer Gear VR headset, so your experience may vary. For my face, however—which probably is wider—the Gear VR not only fits better but also stays that way, and doesn’t require me to jam my glasses in every time. One last note here: both devices let in a bit of light around the nose, but I’ve seen more of it with the Daydream View thanks to its wider opening. A bit of light comes through on Daydream View’s left and right edges, as well. It’s most noticeable when viewing darker content or when the screen is blank, but the resulting glare can disrupt the viewing experience, especially since I have to wear glasses within. It’s worth minimizing natural light and turning off nearby lamps in both cases. 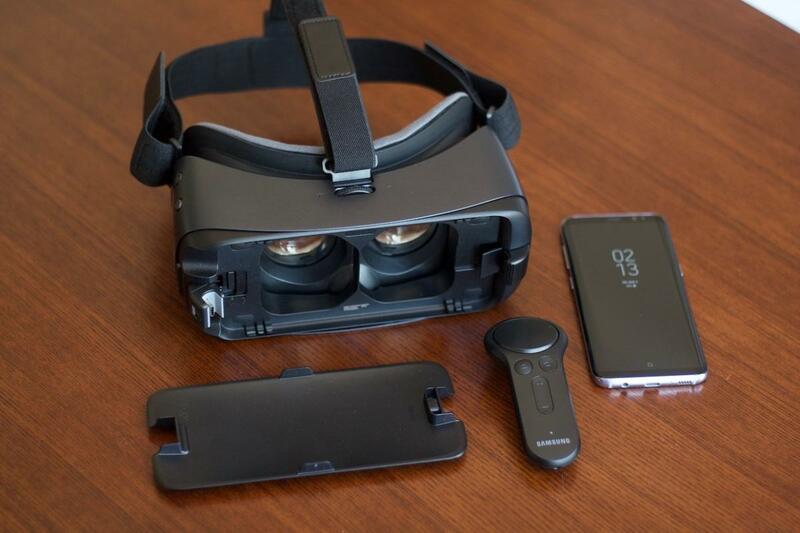 If you want to use the consumer Gear VR, you’ll need a Samsung phone—and not just any Samsung phone. It has to be a Galaxy flagship from the last couple years, which means any Galaxy S6, S7, or S8 model, as well as the Galaxy Note 5. The Galaxy Note7 was also compatible until Samsung recalled all of the devices last year. All have high-res Quad HD AMOLED displays and top-tier processors to handle all of the computing needed for VR, and the newer the phone, the better. You’re less likely to run into slowdown or overheating issues with the Galaxy S8 models, for example, thanks to their added power. Google’s Pixel XL and Samsung’s Galaxy S8 (or S8 Plus) are the best of the best options for each respective headset. It’s a different story with Daydream. 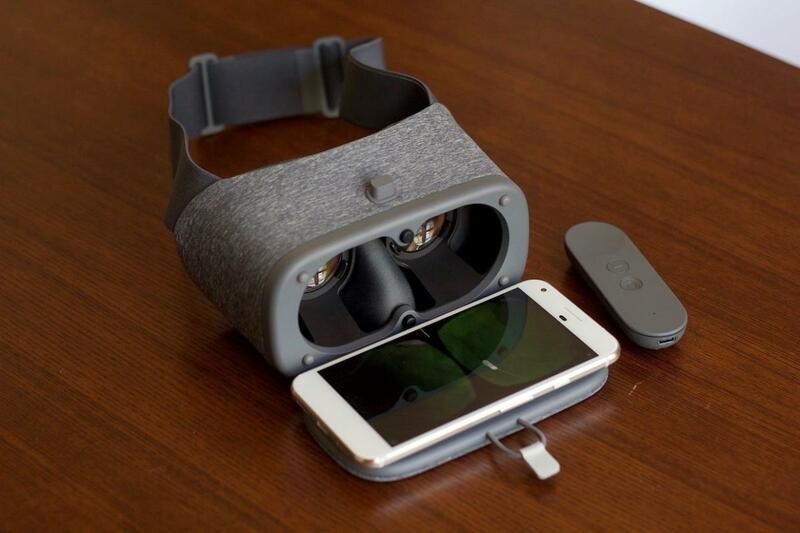 Google’s Android Nougat-driven VR platform is designed to support an array of phones and even eventually more headset models, too. 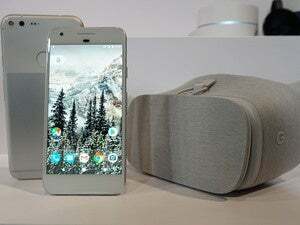 The Pixel and Pixel XL are Google’s own flagship phones built for Daydream, but the View headset also works with the Lenovo Moto Z and Moto Z Force, the Huawei Mate 9, and the ZTE Axon 7. 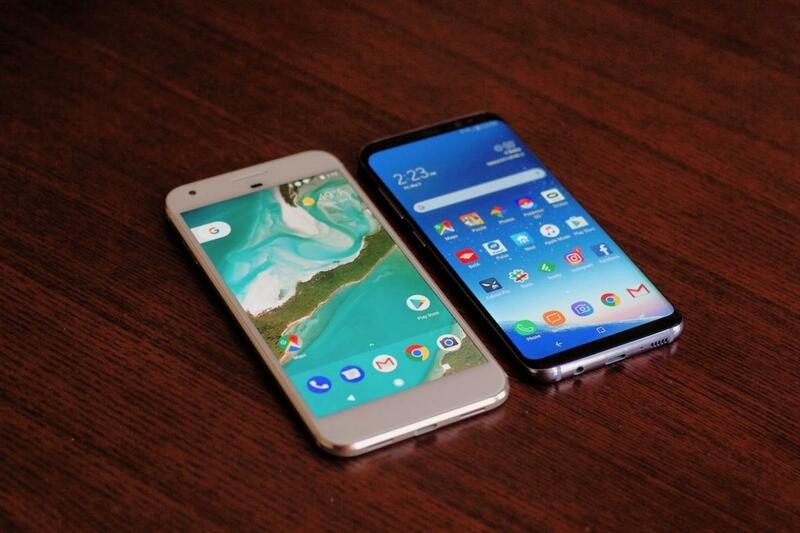 Almost all of those phones likewise have super-crisp Quad HD (2560x1440) screens, but the standard Pixel is the lone exception: with a 1080p display, it packs a lot less pixels into its five inches. That results in less clarity once you strap the phone within an inch of your eyeballs, which means the picture may be slightly muddled. Each screen pixel is larger with a 1080p display, so they’re more noticeable in VR. It’s a definite compromise. Further phones will be added to the Daydream roster in time, and as mentioned, we should also see additional headset options as well. Right now, however, the Daydream View is your one and only option for the platform. And while Daydream supports phones from multiple makers, Samsung’s phones are among the most popular Android devices on the market—so in terms of overall user reach, Samsung has an edge. Both Gear VR and Daydream have in-VR menu screens that let you easily jump between apps, purchase content, and just generally stay inside so you don’t have to take the thing off. The Gear VR menu can be controlled either with the new Controller or using your gaze with the headset’s touchpad, while Daydream uses the controller pointer. When it comes to games, apps, and experiences, on the other hand, Samsung’s two-year lead is strongly felt here. 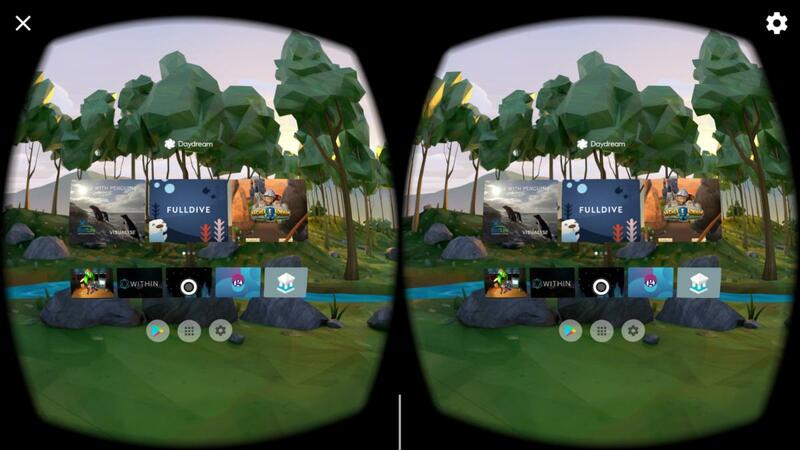 Gear VR has an abundance of apps at this point, including a lot of high-profile releases, while Daydream’s selection is notably sparser. Samsung benefits in part from its association with Oculus, which makes its own PC-based Rift headset but also handles the software platform for the Gear VR. On the other hand, Google is Google. The Gear VR has ports of great games like Minecraft, Hitman Go, and Smash Hit, for example, along with fun originals like Land’s End, Skylight, Darknet, Omega Agent, and Drop Dead. And those are just key examples from a pretty sizable overall stack. Daydream has its own enticing original games, including picks like Untethered and EarthShape from notable indie studios, as well as Lego BrickHeadz Builder VR and frantic shooter Hunters Gate. There are some similarities between their lineups, although not too many. Both have the delightful party game Keep Talking and Nobody Explodes, for example, and each has its own Gunjack space shooter (Daydream’s is the sequel, but they’re about the same, really). Overall, Gear VR not only has a lot more games, but also more enthralling ones that you’ll actually want to spend a lot of time with. When it comes to media apps, you’ll find a lot of the usual suspects on both platforms: Netflix and Hulu have VR versions that let you stream to your headset, for example, while Within is a leading VR video service with music videos, short films, and documentary shorts. You’ll also find the very cool Star Chart, with constellation maps and up-close views of planets, on both. Each service has its own array of other apps not found on the rival platform, as well, such as the underwater Ocean Rift for Gear VR and the Fantastic Beasts movie experience on Daydream. Daydream also has the advantage of Google’s own services, of course, such as a native YouTube app that quickly points you towards the latest VR videos, as well as Google Photos, letting you tap into photospheres of various locales. You can watch YouTube videos on the Gear VR in the web browser, meanwhile, but it’s not as intuitive as Daydream’s app. Meanwhile, Daydream doesn’t even have an in-headset web browser right now, which is a rather curious oversight. All told, where there’s some critical overlap between services, Gear VR and Daydream have a lot of differences when it comes to content offerings. Overall, Samsung has a lot more stuff in the mix, along with the flexibility of using the web browser, while the Daydream platform still feels like it’s just getting started. There’s some good stuff, but not a lot of it so far.